Sherbet Pips Kilner Jar - For all Sherbet Pips afficionados out there! 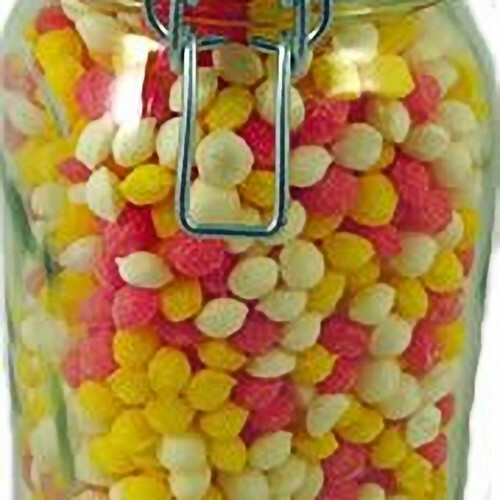 A stunning thick glass large kilner jar filled to the brim with that old chestnut we all know and love - Sherbet Pips. It's a big jar and makes such a lovely, traditional gift for someone really special with a penchant for Pips (or for yourself if you've had a hard day!). And the best bit? Well, once you've gobbled all the sherbetty pips, you can use the jar again and again and again - either with more sweets, coffee, sugar, spices, pasta, lentils, bath salts, screws, marbles, biscuits, ear buds.... I could go on for some time. It'll look stunning on your kitchen shelf! Each large kilner jar weighs a pipping 2kg (contains 1kg of pips) and measures 21.5cm x 10cm x 10cm (that's 8.5in x 4.0in x 4.0in). Brilliantly retro!